Health Watch 3A: Sewage Sludge / 'Biosolids' - Perelandra Ltd. This past June (2002), I was handed a packet of information about 'biosolids' that was put out by a local biosolids company. I didn't know anything about biosolids, so I read through the information. 'Biosolids' is the industry name for 'sewage sludge', and this information was about using sludge on land as an environmentally sound alternative fertilizer. Something in the literature caught my eye and raised a flag. In several places they discussed a strong odor that comes from biosolids after it's spread on land. The fact that they mentioned it several times made me think, 'Brother, this must be some monster odor if the industry feels it must point it out more than once.' I gave the information to my assistant and asked her to check out 'biosolids' on the internet. In short, what was this stuff all about? She spent the weekend on the internet wading through the world of biosolids and sludge. When she sat down to give me a report, she just said, 'You're not going to believe this,' then went on to outline a major environmental and health hazard that is going on all around us — and few of us even have a clue about it. I immediately put together a team of five members of my staff and we spent a week combing the internet, making phone calls, and reading books and articles on sludge. It became quite clear that this is a very serious situation and it affects us all. Here's the definition of sludge/biosolids from the material put out by the Virginia Cooperative Extension, VA Polytechnic Institute and State University that was included in the packet of biosolids information I received: 'Biosolids are solid, semi-solid or liquid materials, resulting from treatment of domestic sewage, that have been sufficiently processed to permit these materials to be safely land-applied.' After you read this paper, you'll see that the industry definition of biosolids is limited and misleading. I'm going to start with excerpts from one woman's statement that was given to the National Press Club in March, 1999. In 1996 she and her family were exposed to sludge that had been applied to a hay field next to her home. Her description of the experience — the smell, the impact this exposure had on the health of her family and neighbors and the problems they had getting any help from officials — is typical of the descriptions we read that week from others from all around the country who had been exposed to sludge. "My name is Joanne Marshall and I come from a small town, Greenland, New Hampshire. Greenland is a suburb of Portsmouth, New Hampshire where the Portsmouth Naval Shipyard and the former Pease Air Force Base reside. It was once a rural community, and has a few remaining hay farms left and one dairy. The neighborhood where we live is a quiet neighborhood where folks gather while shoveling snow, planting their gardens or walking their dogs. I used to call it 'God's little acre.' A great place to raise families until it was disturbed in October of 1995, when large tractor-trailer trucks began rolling down our street in the early morning hours before most people were stirring. These trucks were depositing truckload after truckload of some smelly, murky stuff and piling it on a field next door." "At first there was a faint smell of something in the air. Being down wind from the field, I smelt it most. In all my thirty or so years of living on this street, I never smelt anything like that. I was told the truckers were dumping, in short, a four-letter word beginning with 's' and ending with 't' — sewage, human waste. I remember thinking how inconceivable this was. On October 31st, a week later, I arrived home from work in a hurry. It was Halloween and my little girl was late trick or treating. Grabbing my bags, I bolted out of the car only to be greeted by such a stench, it took my breath away. Nausea hit me like a ton of bricks and as soon as I was inside I ran for the bathroom. That frightful night became the turning point of our serene neighborhood and the beginning of the nightmarish weeks and months to come." 'We called the police department, who knew nothing of the dumping and then the chairman of our Selectmen, who said he also knew nothing. We then called the owner of the field, an elderly widow, who told us that her hayer persuaded her to use this stuff on her field. She said she was told that this stuff would be beneficial to the environment. She was very sorry for the smell, but assured us, as she was assured, that it was healthy and okay." "As days and weeks went by we became sicker and sicker. Not just my family, but our whole immediate neighborhood. We all shared the same symptoms; first nausea and vomiting followed by severe stomach cramps and migraine headaches. Then fever and flu-like symptoms, more respiratory. There was a continual battle of thick mucous, one that made it hard to swallow and discharge. At times it appeared as if our reflex system had slowed because you would gag on the mucous and sometimes choke to dispel it. Often it would wake you because your breathing passages were blocked by it." "Upon discovering that my neighbors were experiencing the same problems, I contacted the Governor's office, which directed me to Health and Human Services, Risk Assessment. The gentleman I spoke with said that our symptoms were symptoms of sludge exposure. I asked if we could have someone come out and test this stuff, but he said he was not the one to do it. He gave us several names stemming from people at DES [Department of Environmental Services] to the Regional EPA office [Environmental Protection Agency] in Boston. Our efforts to contact these people were fruitless. Our phone calls were not returned and if they were, we were treated rudely or given another name to contact. Between my neighbors and myself, we went full spectrum in the contacts we were given, which resulted in nothing." "Approximately three days later, the evening of Thanksgiving, I kissed my son, Shayne of 26 years, goodnight for the last time. Around four a.m. that morning, I was awakened to a frightful scream from my other son, who was home from college during the holiday. When I ran to the room, Shayne appeared unconscious, yet he seemed like he was gasping. 911 was called and all I could do was hug him and wait for the paramedics. We spent what seemed like an eternity in the hospital waiting room, only to be told my son was dead." "The weeks that followed were even more brutal if that were possible. We couldn't grieve for our son because we were too busy fighting illnesses and spending sleepless nights watching over my little girl sleeping, trying to pass the mucous in her throat and fighting viruses. Trips to the doctors and hospital emergency rooms became a frequent thing for my neighbors and us. As one who seldom ever was administered an antibiotic in her lifetime, I went through approximately seven prescriptions of antibiotics within a year. Two of us were diagnosed with Pleurisy. Three to four of us developed abscesses and cysts that needed to be lanced. There were recurring allergenic illnesses in the young babies of the neighbors, but the doctors could not pinpoint the cause. The men suffered severe nosebleeds that were unstoppable. Some of the children suffered unbearable migraine headaches. Both my neighbor and I had tumor masses surgically removed from our breasts. One neighbor suffered heart failure and one was bedridden for weeks. The list goes on and on. By the end of two years, five cats (all mousers — two mine and three my neighbors) as well as my other neighbor's older dog died, all from tumors." "Again to get someone to help us proved futile. Even when noted violations to the 503's [the EPA regulations for sludge] were cited, those whose salaries are paid by us seemed unconcerned and closed a deaf ear. Even the death of my son was not enough to rouse them and investigate the possibility and/or eliminate the connection. Instead they fumbled at trying to find other causes to prove it wasn't the sludge. Even when the autopsy report stated the immediate cause as respiratory and the underlying cause as inconclusive, none of our officials sprang to action. All our phone calls, eventually, went unanswered and we were left to deal with the unknown ourselves. Doctors wouldn't or couldn't help. Their reply was that they didn't know what they were dealing with. Yet they were sure to load us up with plenty of antibiotics. It didn't seem to matter that one life was lost and no one knew why. It didn't seem to matter that proven records of healthy citizens prior to the sludge dumping were all experiencing illnesses of various kinds and medical problems. This was not a concern. Our officials and the people responsible appeared indifferent and uncaring; after all, it was only one life. . . ."
In January, 2002, Joanne Marshall's wrongful death suit against Synagro Technologies, Inc. was finally settled — out of court. She got a major financial settlement, but as part of the settlement, she and her family were put under a gag order and are not allowed to discuss the amount of the settlement or any other details of the case. Luckily, the transcript of the trial belongs to the public. "No pathogens risk assessment was performed for the 503 Sludge Rule. . . ."
"The 503 Sludge Rule failed an extensive peer-review by scientists in EPA's Office of Research and Development. Almost without exception, EPA's own scientists found the 503 Rule to be scientifically indefensible with regard to safeguarding public health and the environment from heavy metals, organic chemicals, and pathogens in land applied sewage sludge. . . ."
"The EPA Inspector General found EPA's oversight of land application of sewage sludge under the 503 Sludge Rule to be ineffective. . . ."
"The National Institute for Occupational Safety and Health (NIOSH) found the guidelines of the 503 Sludge Rule were inadequately protective of workers exposed to sewage sludge. . . ."
sewage sludge during the first thirty days after its application to the [neighboring] field. This is within the period of time that the 503 Sludge Rule assumes that land-applied sludge presents a significant public health risk for most pathogens found in municipal sewage. . . ."
"The 503 Rule does not address risks from inhaling lime dust and irritant gases or serious complications known to occur when people are exposed to a combination of pathogens and irritant chemicals. . . ."
Bacteria can actually increase in numbers during the sewage treatment processes." Metals and Toxics: ". . . Currently EPA regulates only nine metals: arsenic, cadmium, copper, lead, mercury, molybdenum, nickel, selenium, zinc; and the standards for what is allowed are up to 100 times higher (weaker) than any other country has ever proposed. . . . Toxic Waste in Fertilizers: ". . . Twenty-nine fertilizers purchased in twelve states were tested by Frontier Geosciences, and found to contain arsenic, lead, mercury, cadmium, chromium and dioxin. Twenty fertilizers exceeded levels of concern for disposal in landfills. . . . Soil at Risk: ". . . Studies in Europe have found that microbial functions in soils are affected at metals levels that are not toxic to crops. Scientists have found heavy metals in earthworms from sludge-treated soils; rodents fed those earthworms accumulated cadmium, copper, lead and zinc. . . .
Dioxin: ". . . Dioxin is another contaminant of sewage sludge that was not considered when the EPA's sludge rules were written. A national inventory of dioxin sources, the EPA Dioxin Exposure Initiative, reported that a significant release of dioxin to the environment was from the 'land spreading of waste water treatment sludge.' This is a great concern because some crops grown on sludge-treated land are fed to animals, cows and other herbivores that ingest soil as they graze. The greatest route of human exposure to dioxin, a human carcinogen, is through consumption of meat and dairy products. . . ."
Various 'allegations of disease' caused by exposure to sludge have not been investigated and a basic 'framework' for implementing 'human health investigations' regarding sludge exposures needed to be established. A need existed to use 'improved risk-assessment methods' to 'better establish standards for chemicals and pathogens' in sludge. Note: The report also stated on page 252 that sludge is so complex in it's makeup that it can't be assessed. The makeup is always different, depending on the mix of waste materials in it. Therefore, no risk assessment can be done. There you have it: Three scientific reports on EPA's 503 Sludge Rule dating from 1997 to July 2002. And each report points out serious problems with 503. Yet, 503 remains the highly touted standard for land-applied sewage sludge use in the United States. It is also looked at as the established standard for land-applied sludge use in Canada and Western Europe. Just last month (July 2002), Environmental Science & Technology featured an excellent article by David L. Lewis and David K. Gattie: Pathogen Risks from Applying Sewage Sludge to Land. The following are excerpts from that article that I think lay out the problem with the 503 Sludge Rule and the serious health hazards that land-applied sludge poses. In the first section of the article, Lewis and Gattie describe the EPA process for reviewing and establishing rules such as 503 and what happened in the case of 503. ". . . Typically, a rule such as the 503 Rule is reviewed by EPA's Office of Research and Development (ORD) for scientific credibility. . . The 503 Rule was a notable exception. ORD scientists argued that protection of the public health and environment from chemical pollutants and pathogens in sewage sludges could not be fully assured. Nevertheless, under a court order to develop a guidance document for land application, federal rules for land application moved forward without broad support from ORD scientists . . .
". . . In the case of the 503 Rule, the ORD took the unprecedented step of refusing to concur unless a preamble was published with the rule acknowledging its scientific uncertainties. ORD's scientists recommended undertaking the comprehensive research program outlined in the preamble. However, the Office of Water has placed a low priority on funding biosolids research, and EPA met very little of its original $10 million commitment to address uncertainties. The article then addresses the health issues surrounding the use of sewage sludges. "EPA and others have compiled lists of various pathogenic bacteria, viruses, protozoa and parasitic worms potentially found in sewage sludges. "The following organisms are examples of pathogens found in Class B sewage sludge and associated symptoms of exposure. . . . [Class B sludges, which account for most land-applied biosolids, have been treated to reduce pathogen levels using various waste treatment processes. . . They are required to meet certain maximum pathogen levels.] One or more species from the following groups of genera may be represented in Class B sludge. ". . . Although the subject of biosolids is often introduced with a discussion of night soil (human excrement used for fertilizer) the current practice of concentrating urban and industrial wastes with excrement from the global community bears little resemblance to farm life in the 'old world.'. . .
"The bottom line is that land application of Class B sewage sludges is not a simple issue of pathogen versus chemical contaminant risks. The material contains pathogens and mixtures of chemicals that can facilitate the infection process. This presents a pathogen-chemical risk — something about which we know very little. "In our own study, we found that 25% of 48 individuals living near land application sites who complained of chemical irritation had evidence of serious Staphylococcus aureus infections, which contributed to two deaths. . . . These observations suggest that irritant chemicals may elevate risks of infection from low levels of pathogens in sewage sludges, especially with organisms such a staphylococci that tend to enter the body through irritated mucus membranes and skin abrasions. "What are the chances that applying millions of tons of organic matter embedded with irritant chemicals and pathogens nationwide will create a new and significant environmental source of infectious diseases? This prospect merits the performance of comprehensive risk assessments by infectious disease experts and microbial ecologists. . . .
"Host susceptibility is a primary factor to consider when evaluating infection risks. Exposures to chemicals that break down barriers to infection effectively lower the numbers of organisms required to cause, and infection MID [minimum infective dose] probably has little meaning when pathogens are combined with chemicals that markedly enhance the infection process. Whenever possible, steps should be taken to reduce the levels of chemicals in sewage sludge that cause skin rashes, bronchial congestion, colitis and other symptoms that can increase susceptibility to infection. The focus of attention should be on such components as nickel salts and endotoxins, which can be highly irritating to skin, mucus membranes, and the respiratory and gastrointestinal tracts, especially in sensitive populations. "Heavy congestion, a symptom frequently reported among people potentially exposed to sewage sludge dusts, is part of the respiratory system's inflammatory response to irritation. Because respiratory fluids are rich in proteins, they help bacteria to proliferate and overwhelm the body's ability to expel the organisms, as is the case with pneumonia. Skin rashes and irritation of mucus membranes are also common adverse effects reported by people who say they have been exposed to sewage sludges. Like any break in the skin, rashes compromise the structural integrity of the outer layers of tissues and thereby provide a portal of entry for infectious microorganisms. . . .
"Because the 503 Rule allows state and local governments to set stricter standards, a number of counties across the United States have banned land application of Class B biosolids after local citizens alleged adverse health effects." [Author's note: In spring 2002, the Virginia State Supreme Court passed down an opinion stating that localities can't set stricter standards for applying sludge than those already set by the state. Since the state regulations do not allow for banning land-applied sludge, no county or community within Virginia can ban the use of land applied sludge.] Unfortunately, if this trend continues, application of Class B sewage sludge will eventually be concentrated in areas where citizens lack the political and economic resources to deal with environmental problems. "However, public concerns associated with sewage sludges may not be resolved simply by banning Class B sludges. Exposure to chemical irritants increases our susceptibility to infections from all sources. Therefore, some level of concern is likely to remain regarding Class A sludges* that cause respiratory problems and eye, nose, throat, and skin irritation. Once again, infection control problems associated with processed sewage sludges should be viewed in terms of pathogen-chemical risks. . . .[* Class A sludges are materials that are considered safe for immediate and direct contact with humans and animals on the basis of various microbiological assays and process requirements intended to ensure that pathogens are below the detection limits. No crop restrictions are placed on sites treated with Class A sewage sludges.]" Okay. At this point, you know quite a bit about the sludge issue. In fact, you now know more on the subject than some agriculture research scientists! But let me give you some other facts that make this sludge issue even worse. When I first sat down with my staff (the Sludge Busters) to get us started on our journey through the world of sludge, I told them to follow the money. See where it leads us. 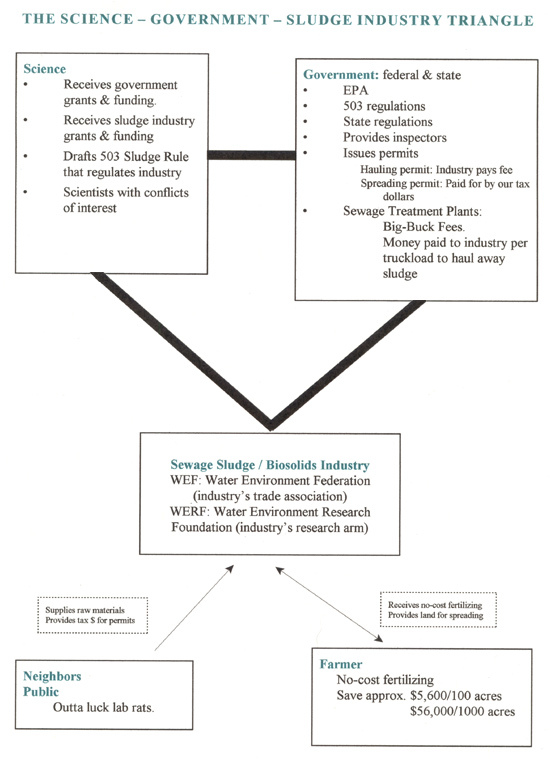 And this is what we found: The sludge industry is big business. Billions of dollars in the United States annually. Let me give you some numbers. For Shayne Conner's life, one person saved a mere $560 and the sludge industry brought in about $22,400. This is 4 times the amount of land spread in Virginia from 20 years ago. including NYC, Philadelphia, Baltimore and Washington, D.C. Here's another dollar number that I feel will help you get the idea of the big bucks involved in the sludge industry. ". . . The city [New York City] has signed contracts totaling $634 million with Merco and New York Organic, in exchange for which the two companies have committed to haul away over a thousand tons per day of city sewage sludge." We found that research is funded and grants are issued from both the government and the sludge industry. One interesting point is that most university studies don't list where their funding comes from. An agricultural researcher at one of our larger universities stated to us that this funding can also be in cash. There's no money trail. The other interesting point, and certainly not a surprising one, is that funding from both government and industry goes only to those who are sludge-friendly. The sludge-industry packet of information I received included a pro-sludge article by Terry J. Logan: Balancing Benefits and Risks in Biosolids. Ohio State University researcher bases his opinions on his own studies, interpretation of published literature, and practical experiences in biosolids use as a consultant to government and industry. I suggested to the Sludge Busters that we find out who Terry Logan is. I don't mean to single out Dr. Logan — he's probably a fine fellow — but he just happens to be the author of an article that was included in the industry packet of information and I wanted to know who he was. Well, we found plenty of information about Dr. Logan in the book, Toxic Sludge Is Good for You! "Dr. Terry Logan, a professor of soil chemistry at Ohio State University, is another sludge advocate who has conflicting roles and interests. He co-chairs the US EPA Peer Review Committee, a group described by the EPA as 'the best scientific talent and data assembled' to help develop recent federal regulations that eased restrictions on sludge farming. Logan also receives $2,400 per month as a paid consultant and board member of the N-Viro International Corporation, which has developed a patented process for converting sludge into fertilizer. . . . At the recommendation of Logan's committee, the EPA promulgated a modification of its 'Part 503' regulations that increased the allowable heavy metals in sludge fertilizer. At the same time that Logan was involved in developing the new, relaxed regulations, he held stock options in N-Viro whose values could have dropped substantially if he had recommended stricter requirements. . . .
". . . In 1994, Dr. Logan was named 'man of the year' by the EPA, and N-Viro, along with the Compost Council and the Rodale Institute, received a $300,000 grant from the US Congress to help promote its product. Dr. Logan is an example of how the Science - Government - Sludge Industry Triangle supports those scientists who are pro-sludge. Dr. David L. Lewis is an example of what this triangle will do to you if you dare to take a public stand against sludge. I was recently given a copy of an article published by the EPA employee union newsletter in July 2002, and this article graphically describes what can happen if you annoy this triangle. "EPA did not take kindly to a 2-page commentary by microbiologist David Lewis published by the British science journal Nature ('EPA Science: Casualty of Election Politics.' Nature. 1996. 381: 731-732). In it, Lewis talked about how poor science behind many of EPA's regulations stand to harm public health and the environment, rather than protect. Having worked at EPA's research laboratory in Athens, GA for over 30 years, Lewis has a wealth of first-hand knowledge on the subject. "In the early 1990s, Lewis led a team of researchers from Washington University Medical School and Loma Linda University's School of Dentistry, which discovered that the AIDS virus could survive disinfection in dental equipment. The findings, which Lewis published in Lancet and Nature Medicine, led to new heat-sterilization standards for dentistry worldwide. "When Nature published a second article by Lewis, which was critical of EPA's sludge rule (Lewis, DL, et al. 1999. 'Influence of environmental changes on degradation of chiral pollutants in soils.' Nature. 401:898-901), the agency removed his director, Dr. Rosemarie Russo, for approving the research publication. "Based on ethic rules requiring 'reasonably prominent' disclaimers, Washington EPA officials retaliated by accusing Lewis of violating ethics rules. The print size Nature used for his disclaimer, saying he was not speaking for EPA policy, was smaller than that used in the body of the article. Lewis, of course, had no way of knowing what sizes of print the journal would use for different parts of his article. Department of Labor investigators found that EPA had applied its ethics rules in a discriminatory manner, and later determined that EPA also denied his promotion in a discriminatory manner. "Although the Labor Department ruled in his favor in these cases, EPA demanded that he resign by age 55 (May 28, 2003) for criticizing the Agency's policies. EPA . . . also took Lewis's supervision out of the hands of his local managers. Everything with his name associated with it had to be approved by headquarters. "In a settlement agreement dated October 7, 1998, EPA offered Lewis an opportunity to conduct research at the University of Georgia for up to four years . . . if he would agree to resign after it was over. . . ."
"EPA's offer posed no financial or career benefit to Lewis. The Agency paid him no money and refused to grant him the promotion he had been unfairly denied. The Agency did pay $25,000 in attorney fees . . .
"Although Lewis had nothing to gain financially from EPA's offer, he had everything to lose in terms of why he went to work for EPA in the first place. His life's work has been protecting public health and the environment. He was the only scientist at EPA who would listen when several mothers and fathers argued that sewage sludge, which EPA approved as a cheap fertilizer, had taken the lives of their children. Hundreds more across the country were sick with the same illnesses that even appeared to affect farm animals and family pets. ". . . For anyone with any heart or conscience, Lewis said, there was really no other honorable choice than to fold under EPA's pressure to resign. EPA had dead-ended his career and going to the University of Georgia was the only way he could continue his research on pathogens in sludge. . . .
"What Lewis did not know was that EPA did not plan to let him continue his work on sludge at the University of Georgia. What he thought would be four years of unhampered research turned into an unending battle against the combined efforts of EPA, Synagro Technologies, Inc., and the Water Environment Federation (WEF) to stop his research on sludge. Synagro, based out of Houston, TX, is the leading sludge company and the WEF is a national trade association for the sludge industry. "Both Synagro and the WEF appealed directly to EPA Administrator Christie Todd Whitman and other top EPA officials to withdraw EPA's support for Lewis's research. EPA was all too happy to work with the sludge industry and go after Lewis. At least one EPA official in the Office of Water went so far as to publicly distribute Synagro materials attacking Lewis's credibility. On another occasion, he solicited help from Synagro in writing a negative internal EPA peer-review of Lewis's research on sludge. "Overcoming strong opposition from EPA and the sludge industry, Lewis's research on sludge was recently published in a British medical journal ('Interactions of pathogens and irritant chemicals in land-applied sewage sludges (biosolids)' D.L. Lewis, et al BMC Public Health 2002, 2:11 - 6/28/02). The Journal of Environmental Science & Technology also featured the research in a 7-page article in their July 1, 2002 issue. This is the first time illnesses and deaths among residents exposed to sewage sludge have been documented in the medical and scientific literature. Simultaneously, the National Academy of Sciences released a report on July 3 citing Lewis's work and supporting the science issues he raised. "Altogether, Lewis's research on sludge prompted two hearings by the full Committee on Science in the U.S. House of Representatives, an EPA Office of Inspector General audit of the EPA's mishandling of science behind the 503 Sludge Rule, and an earlier-than-planned review of that science by the National Academy of Sciences. "Last May, the President of the United States signed the No Fear Act, which was intended to better protect federal employees from discrimination and retaliation. This legislation was drafted by the Science and Judiciary Committees partly as a result of the hearings into EPA's retaliations against Lewis and his director for his publications in Nature. "Two weeks after receiving this letter, Lewis was invited to brief China's Ministers of Public Health, the Environment, and Agriculture in mid-October on his sludge research. When forwarding the invitation to EPA managers, Lewis questioned how he should explain to Communist China's leaders that he is being terminated for criticizing government policies and cannot continue his EPA research. The federal and state governments regulate the sludge practices. The state provides the inspectors who are supposed to make sure the regulations are followed for each sludge application. However, in our area in Virginia, we have one inspector who is in charge of overseeing a four-county area. According to the minutes of a meeting held in 2000, the two largest local sludge companies offered to pay the annual $10,000 salary for our inspector. There's a little conflict of interest. The inspector's salary may be paid for with funds given the state from the industry itself. Currently, the state of Virginia is considering charging a fee to the sludge companies that will pay for inspectors. With this change, we'll have more state-wide conflict of interest. When a farmer agrees to use sludge on his fields, he signs a contract with the sludge company. The company then applies for a permit from the state to spread the sludge on the farmer's land. We discovered that the company does not pay for the permit. That is covered by taxpayer's money. In short, we pay for it. The big bucks are between the sewage treatment facilities and the sludge industry. It's the sewage treatment plants that pay the industry to haul away the sludge at $500 to $700 per truckload (cities pay $700 per truckload). The major portion of sludge hauled by the industry comes from large municipalities. We were told by one farmer who had looked into having his 150 acres spread that the company told him his 'biosolids' would be coming from a local rural treatment plant. This was important to the farmer because he felt the sludge spread on his land would be 'cleaner.' When we checked with three local treatment plants, we were told that each of their plants produces about 1400 wet tons each year. One superintendent said, 'That's peanuts.' Fourteen hundred wet tons would only spread 20 acres each year. The state of Virginia spread 39,000 acres last year. The three local plants together didn't produce enough sewage sludge annually to spread on this one farmer's 150 acres. Contrary to what industry representatives told him, his sludge would be coming from a large-city sewage treatment plant, and this raised serious concerns as to the contents of the sludge. They've got quite a lucrative business. We, the public, supply the raw material. The sewage treatment plants pay the industry to haul truckloads of sludge away. The farmers agree to have the sludge spread on their land for free. In short, the industry is constantly unloading its 'cash crop' at no cost to them. The industry also has some high-powered and highly paid lobbyists. One fellow said, 'If you want to find the biosolids lobbyists in a crowd, just look for the $1000 custom-tailored suits.' In a September 4, 2002 bulletin from the National Whistleblower Center, the collusion between science, government and industry was spelled out well. The industry's trade association is the WEF — the Water Environment Federation. (Note the environmentally-friendly sounding name.) Its research arm is the Water Environment Research Foundation (WERF). Together they hold scientific conferences, publish research and technical publications, and carry out a variety of other activities aimed at promoting land application of sewage sludge. . . . The WEF has over 40,000 members nationwide, which gives the sludge industry the political muscle it needs to have federal funds earmarked to programs promoting sewage sludge as environmentally safe and beneficial. With its research arm, the WERF, it also gives the sludge industry a means to boost the careers of EPA Office of Water scientists charged with regulating the industry. Where does Congress stand on all of this? Squarely on the side of the sludge industry, the WEF, and EPA's Office of Water (OW). Since 1997, Congress has appropriated almost $24 million in federal funds — over twice the amount ORD [EPA's Office of Research and Development] said was needed to fix the science — to promote sewage sludge as a safe and beneficial fertilizer. The funds, which are earmarked by Congress for OW to give the WEF/WERF, is also designated for fighting 'opponents' to OW's programs who spread 'misinformation.' This misinformation includes complaints from citizens sickened by sludge, the opinions of physicians who have treated them, and the research of scientists — some even at EPA — showing that land application of sewage sludge can cause public health and environmental problems. The public at large and those who live near areas that are sludged function primarily in the role of 'outta luck lab rats.' In our research we found that the public is the subject of least concern in the world of sludge use. We're the ones left hanging. It's our health, water, and land that is put at risk so that the big bucks can continue to be passed around the Science - Government - Sludge Industry Triangle. The smell from sludge is, without a doubt, beyond description and beyond anything one can imagine. It's nothing like regular animal manure that's been used for fertilizing for centuries. One woman said it is like having a large pile of rotting groundhogs in a toxic chemical pit at your feet. When I asked one farmer about the irritation and health problems that neighbors might experience from the smell if he sludged his land, he just said they need to 'get over it.' I suspect his response is what his sludge company told him to say when asked that question. We found that other neighbors near sludged fields have been told that if they don't like the smell and 'inconvenience' from the sludge application, they should just move. We know of some who have done just that — moved. We found that one person had been told by her family physician that she had to move if she was to regain her health. A point to remember: Fields do not receive just one application and that's it. They are sludged annually or twice annually. It's a continuous problem for all concerned. Wind can cause a serious problem by spreading sludge dust from the field. It gets into neighboring houses and settles all over the place, gets into cupboards and onto food supplies. It's in your hair, on your clothes and on your bed linens. In short, you can't get away from it. Are realtors required to inform potential buyers that sludge has been spread? — We were told that there are no requirements. But because of problems the realtor might have from a potentially dissatisfied buyer, they all make sure the potential buyer knows about the sludging. It's a matter of ethics. If we wanted to sell our home and land, and a neighbor has sludged one of their fields, has our land value decreased and would there be a problem finding a buyer for our land? — Each realtor told us it would definitely limit interested buyers and affect our land value. We were also told by the realtors that people buying property near sludged fields need to get the well water tested prior to purchase to make sure the water hasn't been contaminated. The farmers are not the bad guys in this. They don't get up one morning and say, 'Today I'm going to destroy my land, kill my livestock and compromise the health of my family and neighbors.' They are making decisions based on the best information they are given. Many farmers question the wisdom of using conventional chemical fertilizers because they don't like what these fertilizers do to the soil. Fertilizer from poultry manure is also questionable because of the potential for introducing Mad Cow Disease to their livestock. Both of these fertilizer industries are unregulated. Then along comes the 'biosolids' industry that appears to be heavily regulated, thanks to 503 — and it looks good. To understand why the farmer makes the decision to apply sewage sludge to his land, let me give you an example of how the industry presents its product. I'm going to quote from the company brochure that fell into my lap. I don't mean to single out just one local company. But it just so happens that it is their information I received. I feel certain that what they are saying is not different from the rest of the industry. One thing to pay particular attention to as you read the industry information is the environmentally friendly language. In the 1980s, the sludge industry was having difficulty getting people to accept the notion of applying sewage sludge to their land. So they hired PR firms that specialized in controversial high-tech safety and health issues to repackage how they present and promote their product, including coming up with a new, more environmentally-friendly sounding name for sewage sludge — 'biosolids.' In short, PR/lobby firms, like Powell Tate, put a lot of lipstick on this pig. By the time you finish reading their presentation, you'll want to sprinkle a little of their product on your cereal each morning. Beneficial Reuse: "In the United States nearly half of the municipal biosolids are recycled and land application programs are used in nearly every state. The increase in land application of biosolids is a response to our limited landfill space and our need to recycle. Communities large and small are benefitting from the cost savings of land application and the environmental benefit of recycling. "Years of study and research supports the safety and benefits of biosolids land application. In 1992 EPA stated that '. . . in all the years that properly treated biosolids have been applied to the land, we have been unable to fine one documented case of illness or disease that resulted.'. . .
"Historically, society has dumped waste at sea and into rivers. Fortunately, The Clean Water Act has put a stop to this disposal method. The nation's waters are cleaner today. Rivers and lakes that were once closed to the public are now vacation spots. We all benefit from halting the dumping of waste into our rivers and lakes. "United States Environmental Protection Agency (EPA) developed the term 'biosolids' to 'emphasize the beneficial nature of this recyclable biological resource.' In 1993 after 20 years of study and research, EPA developed the current regulations [Author's note: this refers to the 503 Sludge Rules] to improve the quality of biosolids for land application. As a result, wastewater treatment plants have been upgraded and industries have installed pretreatment of their waste to reduce pollutants. "Municipal biosolids are an organic source of plant nutrients that builds soil fertility and reduces the need for chemicals. Biosolids are the organic solids resulting from the natural biological treatment of sewage wastewater. The use of biosolids by farmers restores the natural balance of the earth to promote crop growth. Recycling makes sense! . . ."
How Wastewater and Biosolids Work: "A wastewater treatment plant functions similarly to septic tanks and drain fields. It is a natural process that breaks down bacteria and pathogens through exposure to heat and air. A treatment plant is simply processing larger volumes of waste through a more efficient system. Of the household waste entering the system, 28% is from toilets; 72% is was water. A result of the natural treatment process, clean water and stabilized biosolids can be recycled back into the earth. . . . In Conclusion: "As we enter a new century, there is an increasing need to protect our environment. At [company name] we are doing our part to recycle by providing environmentally sound management methods of biosolids. We are determined to decrease the amount of chemicals that pollute our land and waters by increasing the recycling of biosolids. Together, we can provide for a greener tomorrow. . . .
Miscellaneous — asbestos, petroleum products, industrial solvents. "In addition, a 1994 investigation by the U.S. General Accounting Office found that 'the full extent of the radioactive contamination of sewage sludge, ash and related by-products nationwide is unknown.' Most of the radioactive material is flushed down the drain by hospitals, businesses and decontamination laundries, a practice which has contaminated at least nine sewage plants in the past decade. . . .
"Dr. Stanford Tackett, a chemist and expert on lead contamination, became alarmed about sludge on the basis of its lead content alone. 'The use of sewage sludge as a fertilizer poses a more significant lead threat to the land than did the use of leaded gasoline,' he says. 'All sewage sludges contain elevated concentrations of lead due to the nature of the treatment process. . . . Lead is a highly toxic and cumulative poison. Lead poisoning can cause severe mental retardation or death. It is now known that lead interferes with the blood-forming process, vitamin D metabolism, kidney function, and the neurological process. From the standpoint of lead alone, sludge is 'safe' only if you are willing to accept a lowered IQ for the young children living in the sludge area. . . ."
I can't imagine that you are not now alarmed by this sewage sludge crisis. But just in case you live in a city or suburbs and can't figure out how all this concerns you (except for the fact that urban dwellers are the major supplier of raw material), let me add another piece of information that directly effects you. "Once 'biosolids' are accepted as a crop fertilizer, the powerful National Food Processors Association lobby will 'strongly oppose' any labeling of food grown on sludge land. According to NFPA representative Rick Jarman, consumers don't need to know whether their food has been grown in sludge. Currently, 'certified organic' farmers are prohibited from using sludge on their crops, but the sludge industry is pushing for acceptance by organic farming organizations, and this will be a battleground for industry PR in the future. The amount of farm acreage dedicated to organic farming is currently very small. However, said Brian Baker of California Certified Organic Farmers, "imagine what great PR it would be for the sewage sludge promoters to say that sludge is so clean it can even be certified organic — what a way to 'greenwash' sewage sludge!" . . .